There are a number of ways to explore the Northshore. By car is great. Kayaking provides unique vantage points from moss-draped bayous. But for conveying a real sense of place, for revealing the area&apos;s personality and its magic, the Tammany Trace is a treasure. 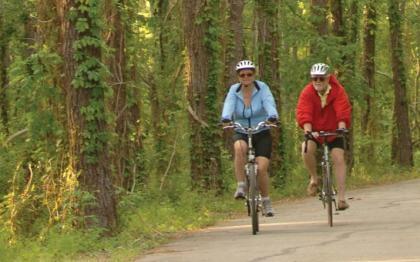 Louisiana&apos;s only rails-to-trails conversion, the 31-mile Trace winds through the Northshore, a paved ribbon connecting five communities interspersed with lovely green space. The path offers all who ride, walk or even rollerblade it, a way to experience both the towns and the natural beauty that so enhances the quality of life on the Northshore. Originally a corridor for the Illinois Central Railroad, the Trace now is an earth-friendly hike and bike trail stretching from downtown Covington, through Abita Springs, Mandeville, and Lacombe and ending in Slidell. Some visitors come to the Trace for a leisurely stroll with their families. Others power-walk the path, getting their daily exercise and a dose of fresh air. Serious cyclists, in racing jerseys and Lycra shorts with padded buns, speed through from beginning to end (and sometimes back). Others pedal slowly, just soaking in the restorative scenery. In 2017, the Tammany Trace was inducted into the Rails-to-Trails Hall of Fame. There are numerous entry spots for the Trace - most communities have their own trailheads - but the official trailhead is located on Koop Drive off Highway 59. A green caboose serves as the information and souvenir center and ranger office for the Trace. Also here are restrooms, water fountains, a pavilion, the Kids Konnection playground and picnic tables. The Covington Trailhead features a campanile, bandstand and amphitheater, as well as visitor center. Located at the intersection of New Hampshire and East Lockwood streets, the little park offers a spot to enjoy historic downtown Covington as well as begin a cycling adventure. A number of restaurants are nearby if you want to grab something to eat. Abita Springs enhanced its heart-of-town Tourist Park by moving the historic pavilion toward the entrance and adding the Abita Trailhead Museum. The little museum is housed in the 1911 bachelor quarters of the town&apos;s old Longbranch Hotel, moved to the site to serve as history museum, trailhead and visitor center for the little town. It sits right on the Trace, steps from the Abita Brew Pub and within easy walking distance of other restaurants and attractions. Mandeville is another great spot for entering the Trace. Its Mandeville Trailhead and Cultural Interpretive Center is adjacent to the path. The center also plays host to the Mandeville Community Market on Saturday mornings, free Friday evening concerts and other special events. The trail ends (or begins, depending on where you start) at the Slidell/Carollo Trailhead on Highway 190 (Gause Blvd.) where you&apos;ll find parking, information and restrooms. Nearby are restaurants and shopping. Some tips: The Tammany Trace is closed to motorized traffic except for authorized emergency vehicles and the vehicles used by park rangers who patrol its length from daylight to dark daily. Bring your bike, your rollerblades or just your favorite walking shoes and enjoy the Trace. Don&apos;t bring your pets; they&apos;re not allowed.